There was a time when New Zealand was predominantly made of just two cultures – Maori and European. We were bicultural and we took faltering first steps to make it work. But bicultural is not who we are any more. Who we are is a nation of peoples from all over the globe. Maori. Europe. Asia. Africa. The Pacific Islands. Australia. The Americas. We all call New Zealand home – the place where we raise our families, where we watch our kids play sport, where we work and vote and try our best to do right by each other. New Zealand is our country. We are a multicultural nation of equals. But are we stuck in the past? How do we honour New Zealand’s historical past without being continually defined by it? How do we shape a better future? New Zealand’s Parliament contains a number of seats reserved especially for people of Maori descent. These seats guaranteed Maori a direct voice in Parliament. The Maori seats were first introduced in 1867 and for good reasons. Despite the Treaty promising full equality in terms of the rights, privileges and duties of citizenship, the land ownership requirements of the day denied many men – both Maori and European – the right to vote. To address this, protected Maori seats were created as a temporary measure to give Parliamentary representation to Maori men until they were able to vote on the common roll. Although full voting rights for men were granted in 1879 and for women in 1893 – giving all New Zealanders of age equal rights to vote – the reserved Maori seats were retained. This continues even though Maori representation in Parliament now disproportionately exceeds their relative national population. As a result, the seats that once preserved equality are now a form of discrimination based on race. By reserving this privilege for Maori alone, it suggests that one race is worthy of more consideration than all the others. As New Zealanders, do we truly believe this is right? To ensure that our Parliamentary system provides fair and effective representation for all New Zealanders, the 1986 Royal Commission on the Electoral System made a series of recommendations. In their report “Towards a Better Democracy” the Commission recommended our First Past the Post voting system be replaced with Mixed-Member Proportional representation, or MMP. They also proposed that the Maori seats and the Maori electoral roll be abolished on the basis that separatism is not the answer to Maori advancement. Equality is. The time has come to reshape things to reflect the many races-one people-all equal nature of our nation. If we want that change, one common electoral roll for all is an essential starting point. To move forward, we must convince our politicians that during the next term of Parliament, a law change is needed to abolish the Maori seats and establish a common electoral roll. The process must involve every voter – not just those who enjoy the present constitutional privilege. Will the new government do it? Only if enough New Zealanders convince the politicians that doing so is in the best interests of the country, and that our future must be ‘One people. One nation. Together’. If you agree, there are three things you can do. Firstly, contact MPs and candidates and ask if they will support the change to a common roll. Ask for their party’s commitment to abolishing the Maori seats, with all New Zealanders involved in the process. Secondly, share this call to action with your friends and ask for their support for our campaign for change. Thirdly, and most importantly, send a donation so we can publish this message throughout the country. What you have just read is the text of a public information advertisement that we would like to publish in as many newspapers as possible. You can see what this campaign for change advertisement will look like HERE. The web address for the campaign is Campaign4Change.org.nz. It is a fundamental tenet of democracy that all citizens should be treated equally in law. We believe that should start with the removal of race-based seats and electoral rolls. We would like to reach out to as many other New Zealanders as we can with that message, and we are asking for your help. If you would like to support our campaign for change advertisement being published in newspapers throughout the country, please click HERE. Concerns about racial privilege in law and the legal discrimination it creates are widespread throughout the world. Just last week, the Swedish government announced that it intends removing ‘race’ from its statute books, arguing that race is a social construct, which should not exist in law. The Swedish Immigration Minister, Erik Ullenhag, explained that “the fundamental grounds of racism are based on the belief that there are different races, and that belonging to a race makes people behave in a certain way, and that some races are better than others.” The government rejects these sentiments. Closer to home, Fiji removed the concept of race and racial privilege from law in their new constitution in 2012. As a result, race-based electoral rolls and race-based seat quotas were eliminated. Under the new system, all Fiji citizens are now called “Fijians”, irrespective of their origin, and the use of race and ethnicity to define communalism and privilege, is no longer lawful. In his article, Voltaire! Thou shouldst be living at this hour!, David reflects on how bowing to racial privilege undermines the cornerstone of our democracy – the rule of law. To read the full article, please click HERE. With the full resources of the State at her fingertips, Dame Susan should be only too aware that while disadvantage does exist in New Zealand, it is not linked to race, but to a host of social factors, such as long term welfare dependency, family breakdown, alcohol and drug dependency, child abuse and neglect, educational failure, poor health care, violence and crime. These unfortunate factors do not have racial exclusivity. Since they are largely behavioural, to stop the cycle of disadvantage repeating itself through the children, interventions are needed to support such families to move off welfare and take responsibility for their future. In 2004, Don Brash’s Nationhood speech elevated race relations into a major public policy concern. With widespread unease that the Treaty of Waitangi settlement process was getting out of hand, it became a key election issue in 2005. Helen Clark was one of a number of party leaders that pledged to end the historic claims process, announcing a cut-off date for lodging such claims – September 1st 2008. On 8 December 2006, the Treaty of Waitangi Amendment Act, setting that deadline, was passed by Parliament. The parties that voted in favour were Labour, National, New Zealand First, United Future, and the Progressives, while the Greens and the Maori Party were opposed. ACT failed to vote. The point is that political parties and governments will make tough decisions on contentious issues, if public concern is strong enough to force their hand. To abolish the Maori seats and establish a common roll, we need people up and down the country to call for change. 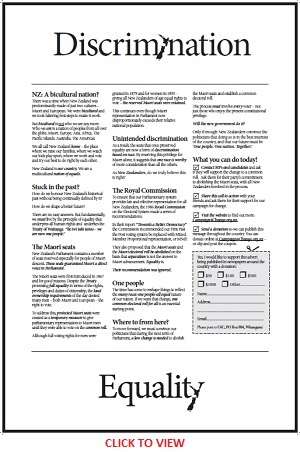 Please donate generously so we can publish our ad in as many newspapers as we can to get the ball rolling. How important is abolishing the Maori roll and seats to you: – very important, important, or not important?